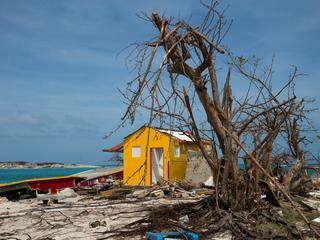 Jeroen Pauw has sixteen months after hurricane Irma a visit to Sint Maarten, and find the criticism that the reconstruction of the island to slowly go wrong. “I think that we in the Netherlands are not so strict for these islands. There are there every year hurricanes. When I was in St. Maarten was, I read that Schiphol platlag because there is 3 inches of snow was expected. So, We must not pretend, we all know better,” he says in the This is the news podcast NU.nl. More than 0.5 billion euro by the Dutch government made available and with a tv campaign was almost 20 million euros were collected. The Court of auditors came in december with a critical report. The conclusion was that there is still but little has happened. “You have to understand that there is not every day a train can come up with materials. It is an island. In addition, the surrounding islands are also affected. Sint Maarten is an island completely focused on tourism, so there are a few carpenters or other professionals to find. All obstacles for a rapid reconstruction,” said the presenter. “Most of the hotels on the island are restored. That is often the fastest, because it is the main source of income. Often funded by insurance or private money,” says Peacock. According to Pauw, the inhabitants of the island of understanding. “Of course, they will find that it takes a long time, but they don’t understand that you have that island, not quickly can build up and the good must be done.” In addition to the inhabitants, speaks of the Peacock is the prime minister of Sint-Maarten, Leona Marlin-Romeo, and former state secretary Frans f. weekers, on behalf of The Hague and the reconstruction progress. Peacock on Sint Maarten is on Monday 11 February at 22.10 pm on NPO1.